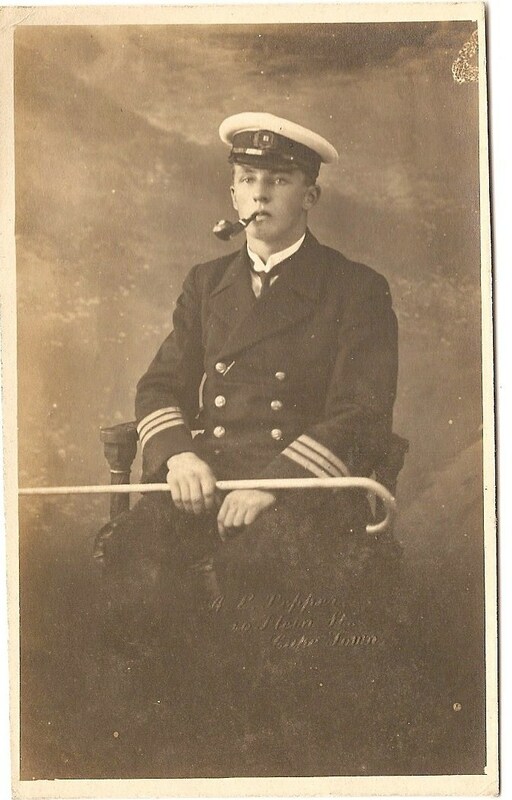 Much of what we know about the dying days of sail was recorded after the First World War, when most of Britain’s last old sailers had been sunk or ‘sold foreign‘. Eric Newby’s The Last Grain Race and Elis Karlsson’s excellent Pully-haul were published as late as the 1950s and ‘60s, both about what were by then Finnish-owned vessels – the Moshulu, now a restaurant (!) 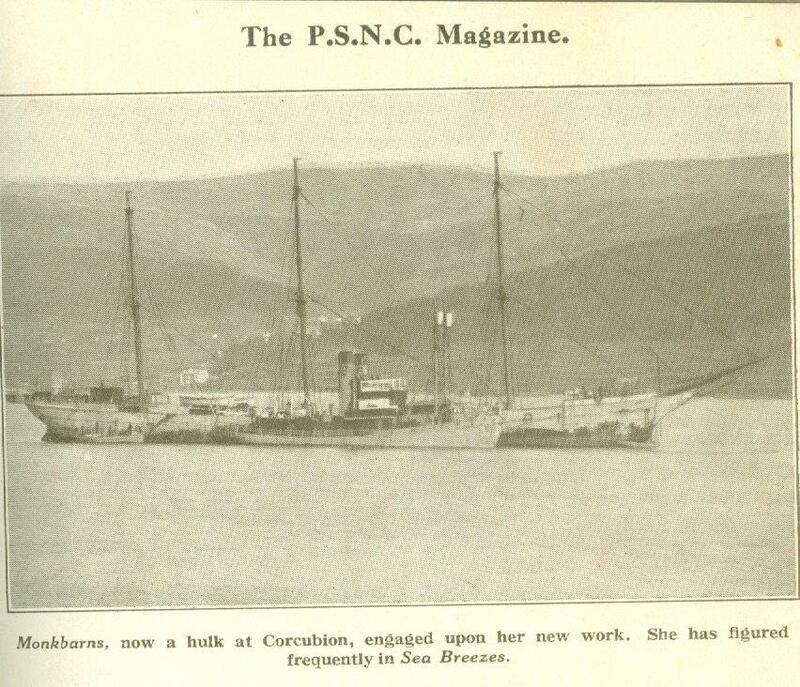 in Philadelphia, and the Herzogin Cecilie, a wreck off Salcombe, Devon. 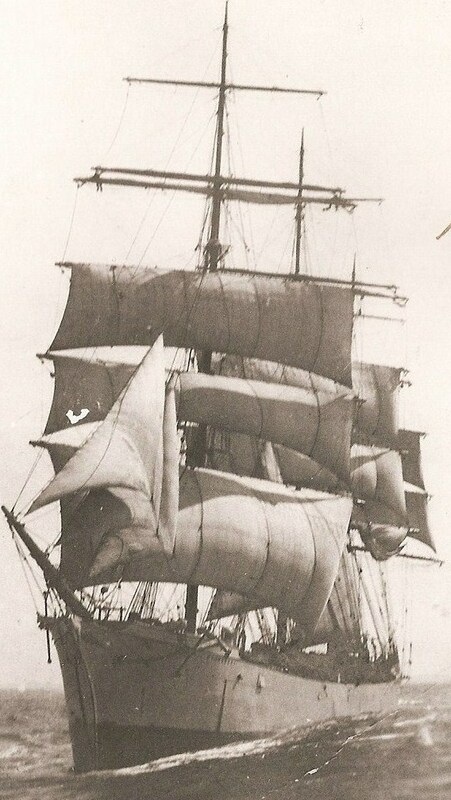 But in the summer of 1913, when the Liverpool-registered square rigger Monkbarns arrived off Australia from South America with a state-of-the-art Cinematograph movie camera provided by the Kineto film company of Wardour Street, London, “Everything that could be filmed about life aboard had been filmed,” the resident amateur cameraman noted. Dr Dudley Stone was a keen yachtsman and junior doctor at St Bart’s hospital London who had joined Monkbarns in Gravesend that February determined to chronicle what was even then obviously the end of an era, from “swinging the ship” for correcting the compass before they sailed to the shanties round the capstan as they weighed anchor. His commission was to “obtain pictures of the ocean in its angry moods”. It was Kineto’s second attempt, after the chap it sent out the previous year had found himself vilely incapacitated by seasickness. 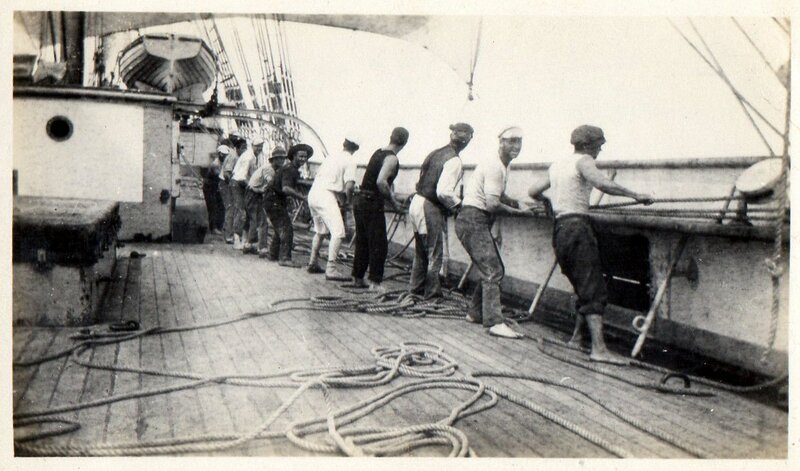 Over the months that followed, as Monkbarns crossed the Atlantic to Buenos Aires with a cargo of cement and then headed back eastwards in ballast round the Cape of Good Hope to Sydney, he shot 9,000 feet of film: of the men hauling and chipping, of the view from the yards, of big seas and the master in his oilskins. He developed it in his cabin and dried it all in strips festooned around a lazarette under the fo’c’sle head. “I have cinematographed with no gloves and with oilskins and top boots on from aloft from almost everywhere.” Dating and developing it all had taken up to five hours a day, he wrote from Newcastle NSW. Sadly, this nearly two miles of film seems to have disappeared. It is mentioned in the Australian newspapers of the time and was picked up years later by Captain “Algie” Course during the fireside yarns with fellow Cape Horners that formed the basis of his account of Monkbarns in The Wheel’s Kick and The Wind’s Song, but of the actual film there is no trace, not in the National Maritime Museum collection, nor the British Film Institute, nor the Australian Maritime Museum in Sydney. 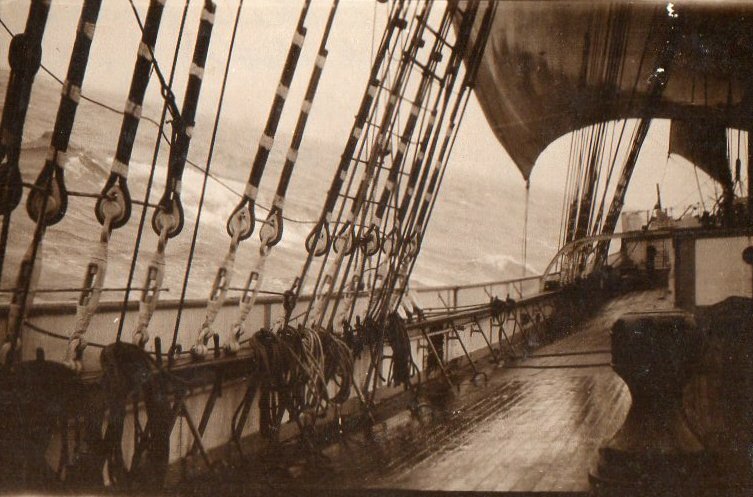 Shot from a heaving deck over 100 years ago, washed in saltwater, dried in a dusty locker and exposed to sulphur fumes when the ship was fumigated in Newcastle, it is unlikely any of it has survived. Dr Stone’s unfinished diary, however, did survive – in the National Maritime Museum in Greenwich – and even without moving images it provides a rare glimpse of working life aboard one of the last British full-rigged ships a full 16 years before Alan Villiers and his ill-fated colleague Ronald Walker immortalised Grace Harwar, the last full rigger in the Australian trade. Stone and his friend and patient, the Honourable John Gilbert Eveleigh-de Moleyns, aged 34, fifth son of the 4th Baron Ventry, were an odd couple aboard a working ship; de M’s condition is not identified but he lay down every afternoon, and usually played Euchre with the Mate for matches in the evenings or made quoits, which he played on deck when the weather permitted. 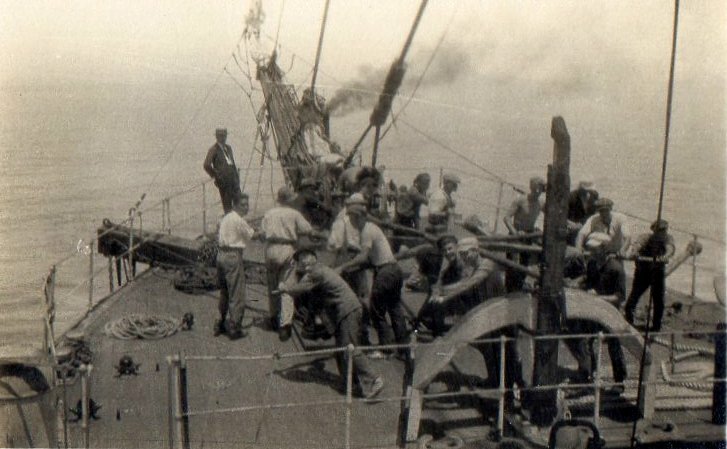 Meanwhile, Stone was out along the yards or down the holds in all weathers with his Cinematograph, filming, or learning to take a noon sight and wrestling with calculations of the ship’s position and progress. Neither did any actual work aboard, apart from “tailing on” occasionally. But they roamed at will armed with a Videx Reflex and a Brownie, and Stone’s eye was keen. He noted the pilfering of stores by the ever-hungry apprentices, rough justice for a suspected thief who was given a hiding by his shipmates and booted ashore in Buenos Aires, and the stowaway “discovered” drinking tea in the fo’c’sle after they sailed. The Mate hadn’t known he was aboard, but the master did. Desertions had left him shorthanded. Two “stowaways” appeared after the ship had sailed, and both were entered on the articles at £1 per month. Patrick Haggerty was an Irishman from Queenstown, Cork, red haired, blue eyed and popular. A fine shantyman, said Stone. He claimed to be off an Italian barque that had gone ashore near Buenos Aires and had only the dungarees, socks, cap and shoes he stood up in. After he was found half frozen at the wheel one night, the ship had a whip-round for him: the Mate gave him a shirt and an old oilskin, de M donated pants and socks, Stone rooted out an ancient spare jersey. Stone’s surviving diary begins as they leave Buenos Aires. A doctor was a familiar sight on passenger steamers, schmoozing the saloon crowd and keeping at bay any unpleasantness from steerage. Naval vessels too usually had a surgeon, to patch up battle injuries. But merchant ships knocking about the world with cargoes of nitrate or guano rarely enjoyed the luxury of trained medical assistance. 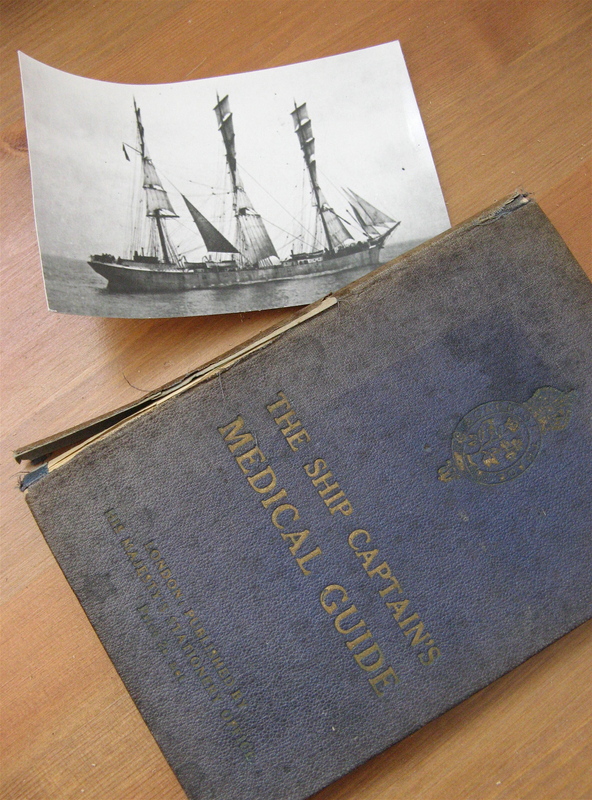 In the days of sail, physicking the crew was the responsibility of the “Old Man”, supported by a dog-eared copy of the Ship Captain’s Medical Guide and a case of pre-mixed bottles and papers labelled Solution No. 5 and Powder No. 3. Far from land, way off the steamer tracks and with no wireless to call for help or seek advice, the master had to rely on common sense and caution. Any ailment that didn’t involve actual blood loss was potentially malingering, and logs show intervention was rarely rushed. It is hardly surprising then that the presence of a bona fide doctor aboard Monkbarns was greeted with enthusiasm by her crew. They set off from BA with all seven apprentices and three of the fo’c’sle down with diarrhoea, due to “the change of water”, the master diagnosed, and throughout what was to prove a very rough passage Dr Stone was kept busy. Within a week storms were raking the ship. It was hard to sleep, wrote Stone. The main royal broke loose and tore both sheets out. The foresail ripped the starboard reefing jackstay clean off the yard, and the fore topmast staysail chafed most of the way through its bolt rope. In the store room all the pickles and a case of kerosene were lost. The following morning Stone watched the steward and two of the apprentices leaping about among the stores trying to catch tumbling tins. “Some had burst (I only hope they are the ‘blown’ ones I saw and that we will be saved from Ptomaine poisoning)”. The fore hold was a jumble. 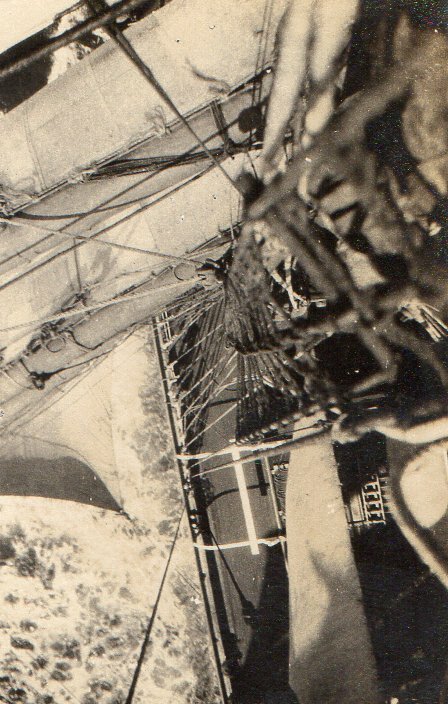 There was rope everywhere, hanging over the edge of the ‘tween decks and tumbled below. The ship had acquired a list to starboard, and was rolling badly. The skipper had told him the squalls had been hurricane force 11 to 12, and that they might not have survived the night if the ship had been loaded. 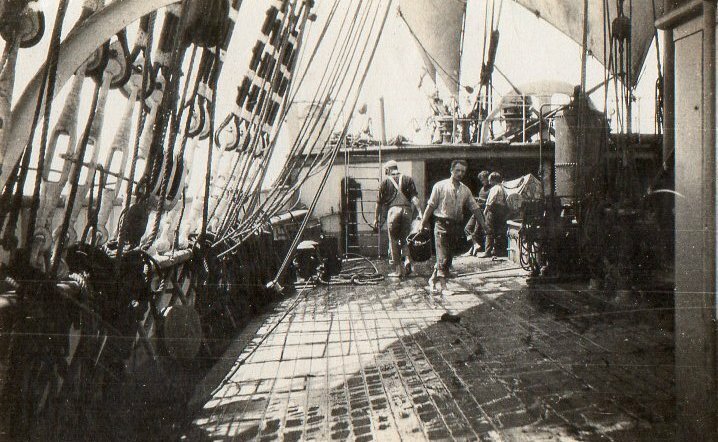 The boys’ half-deck had flooded. Stone, who did not have to get up in the night to clamber aloft replacing blown-out sails, or sleep on a wet bunk in wet clothes, was amused to note that all the master’s drawers had shot out and his rug had spontaneously rolled itself up, but he was less pleased that the loss of the oil meant lights out at 9pm. There were only four candles aboard (his and de M.’s) and the ship was “badly found for matches”. As paying passengers Stone and de M. occupied separate cabins in the saloon aft, with a porthole and two bunks each for all their gear. This left Leslie Beaver, the out-of-time apprentice acting 3rd mate, relegated to the lower bunk in the 2nd mate’s cabin. On June 7, Stone saw six “patients”, including Chapman, whose leg was skinned from knee to ankle. My own grandfather, then an apprentice of 18, sidled into the narrative with a tap at the doctor’s cabin door that evening. Stone noted an inflamed ligament, painful to the touch and prescribed iodine. Chapman’s raw leg was much better, a swollen knee was down and young Sivell was back at work again, against medical advice – (fed up with doing nothing, noted Stone.) Meanwhile, there was a strained shoulder to inspect (“nil to be seen. I’m safe…”), and the 3rd Mate had been shot into the scuppers on his stomach during a particularly heavy roll, resulting in appalling bruises but fortunately no internal injuries. And still the glass continued to fall, down to 28.58. The fore lower topsail carried away. The Old Man – who was 64 and had been up all night – was laid up with cramp in the chart house, and the foremast staysail was a rag. The hurricane squalls and strong gales continued for three weeks, almost without let up. Stone and de M. would tell the newspaper reporters waiting in Newcastle that they were both “ardent lovers of the sea” but neither of them ever wished to undergo such an experience again. 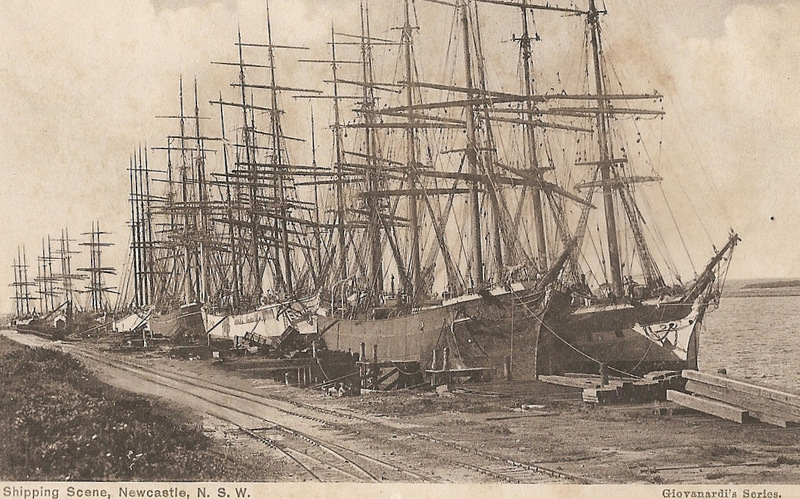 Monkbarns was one of five sailing vessels that arrived at Newcastle on the weekend of 5th July 1913, including the full-rigged Ben Lee, which had sailed from Buenos Aires two weeks before her. All had suffered. 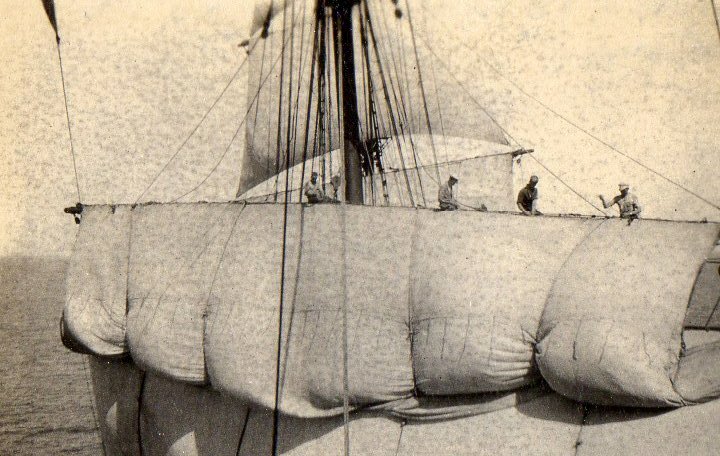 Ben Lee’s lower topsail had carried away and the foresail was blown to pieces. Kilmallie, from Santos, lost a lifeboat and her ballast shifted. The barque Lysglimt, from Natal, was knocked onto her beam ends when her ballast shifted, and the crew spent three death-defying days in the hold trying to right her, the Sydney Morning Herald reported. Despite or possibly thanks to the hurricane, Monkbarns had made the passage in 52 days, to Ben Lee’s 67. Our man on the docks reported that two of Monkbarns’ crew had been injured and had been “attended by Dr M Stone, a passenger”. Up in Newcastle, (where they went because there was smallpox in Sydney and the city was about to be quarantined), the Newcastle Morning Herald & Miners’ Advocate produced a much juicier report, headlined “An interesting visitor”. Dr Stone, it said, had been imprisoned by Germany for spying the previous year (shades of Erskine Childers‘ The Riddle of the Sands). Dr Stone did not deny it. He had been one of a party of five well-to-do British yachtsmen – including the marine artist Gregory Robinson and the engineer William Richard Macdonald, who happened to have patented a nifty bit of submarine technology. They had attracted unwelcome attention from the German military authorities by happily photographing naval installations along the Kiel canal. It had taken them five days to talk themselves out of jail. During the war that broke out less than a year after Monkbarns’ arrival in Newcastle, Stone would serve in the Royal Army Medical Corps. He became an eminent radiographer, with an obituary in the British Medical Journal in 1941. The Kineto company, however, folded in 1923 and de M died in New Zealand in 1928, the year after Monkbarns was hulked off Corcubion, in northern Spain. Stone carried on yachting all this life. Perhaps he even shot more films. But what became of his footage of working life aboard a British ship in the last days of sail remains a mystery. An edited version of this article appeared first in The Cape Horner magazine, the journal of the International Association of Cape Horners. August 2015. Photographs by Eugene Bainbridge, who was Monkbarns’ last apprentice during her final voyage, 1924-26. He joined her in Newcastle NSW, having steamed out from the UK third class aboard the P&O passenger ship Barrabool. He was then 19, the privately educated only son of a maritime insurance broker from Surrey. He had a Leica camera and for two years he kept a diary and took pictures of life aboard. Neither the diary nor the photographs were ever published and Eugene never went back to sea. These previously unseen views are made available by kind permission of his family.